Forget drone deliveries. It's all about cute self-driving robots now. At least that's what Skype's co-founders Ahti Heinla and Janus Friis are hoping for. 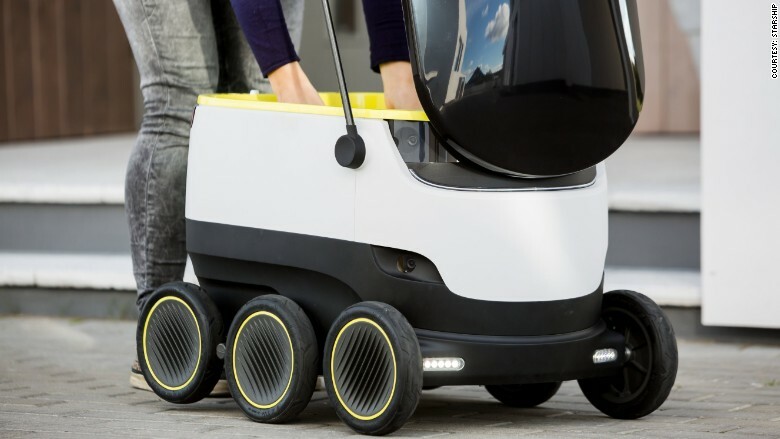 The two have launched a robot company called Starship Technologies, hoping to solve the "last mile problem" of delivering parcels from transportation hubs to people's homes. It's a huge challenge for businesses. Delivery trucks contribute to congestion and their drivers have to deal with nightmare parking problems. Plus they are expensive -- experts say at least 28% of transportation costs are incurred during the last mile. Tech companies like Google (GOOGL), and Amazon (AMZN) want to tackle the issue by using drones -- but so far haven't been able to overcome regulatory roadblocks. Heinla and Friis say their robots could provide a way cheaper and safer solution. "They travel at the slow speed of four miles per hour -- a brisk walking pace," Heinla said. "They travel on pavements (and) sidewalks, blending safely in with pedestrian traffic." 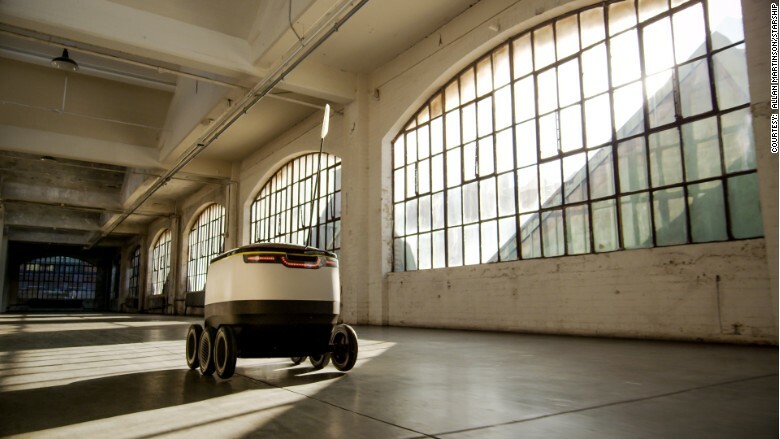 The robots can detect obstacles, change speed, and stop to cross the streets, the company said. If things go wrong, human operators can take over the steering, viewing the world through the robot's "eyes." The machines are equipped with microphones and speakers and can talk to humans they meet. They are meant for a suburban environment, rather than busy city streets. The company said the robots use similar technology as self-driving cars, but are cheaper to build. Customers will be able to gain access to the vehicles to collect their parcels or groceries through a mobile app. The robots are equipped with GPS tracker and lock to prevent thefts. 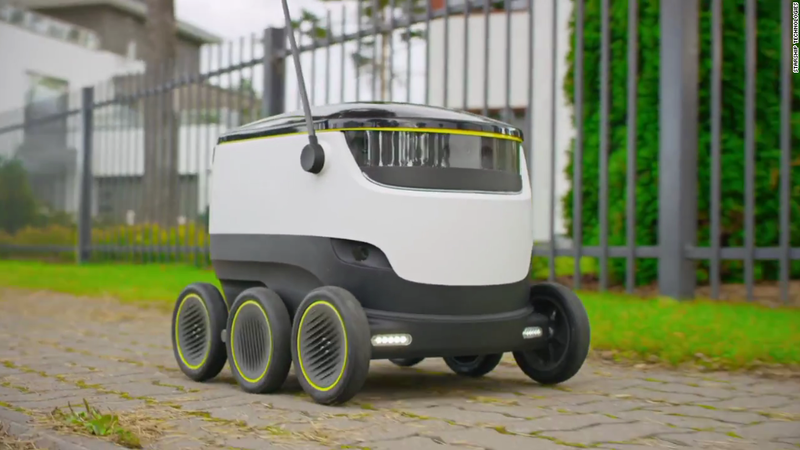 Heinla says the battery-powered robots need less energy than most light bulbs, and are capable of delivering the equivalent of two grocery bags within 5-30 minutes from a local hub or store, 10 to 15 times cheaper than the current delivery alternatives. "We want to do to local deliveries what Skype did to telecommunications," Heinla said. Starship Technologies is planning to launch pilot services in the U.S., the UK, and other countries in 2016, and wants to roll out commercially by 2017. The company will have to figure out how to navigate regulation, which varies greatly between countries and even individual U.S. states.